Visitor's Feedback, Recommendations, testimonials and messages. Visitor book remarks, emails and postcards received. We hope that you enjoy them? Bill, Just a quick email on behalf of Hazel, myself and Ozzy to thank you for a wonderful stay last week. The accommodation and fishery is a credit to you and I wouldn't hesitate to recommend it. The flyover of a Bee eater capped the week! 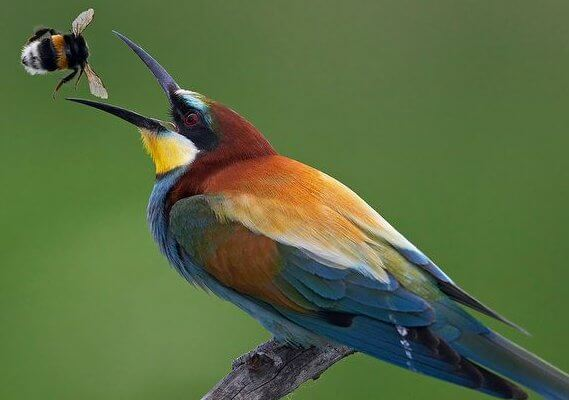 European Bee-Eater bird (Merops apiaster or Gwybedog y Gwenyn)! A colourful wanderer from southern Europe, last known confirmed sighting at New Cross on 21st June 1993, a couple of miles from our location. Hi bill just a quick thank you for another brilliant stay. With a new pb it just gets better. 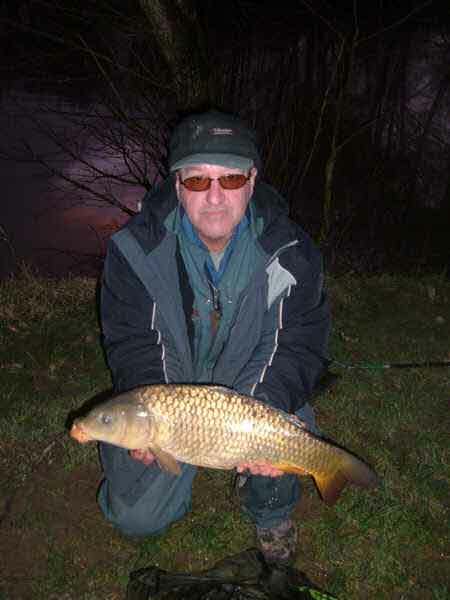 The chub and barbel add more interest as to what is taking the bait when the float goes under. The big roach in the house pool are still alluding me though but maybe next time. Many thanks to Val and the girls for keeping the accommodation spotless as usual. Just a quick line to let you know how much I enjoyed my short visit on Monday 20th February. Although it was quite windy the air temperature had risen a lot and the carp were very active. They came up to my floating bread and I managed to catch twelve fish in a couple of hours weighing up to ten pounds. The fish were in excellent condition and I think that provided the weather doesn’t turn cold the fishing should get even better in the coming weeks. The water was quite coloured and there was plenty of evidence the fish were also feeding on the bottom from the ‘mud clouds’ being stirred up. I hope to be with you again soon. Richard loved the fishing and all the help from Bill. Great seeing all the birds of pray and other wildlife. We will return next year without fail. Just wanted to thank you for a wonderful mornings fishing last Tuesday on your trout lakes. 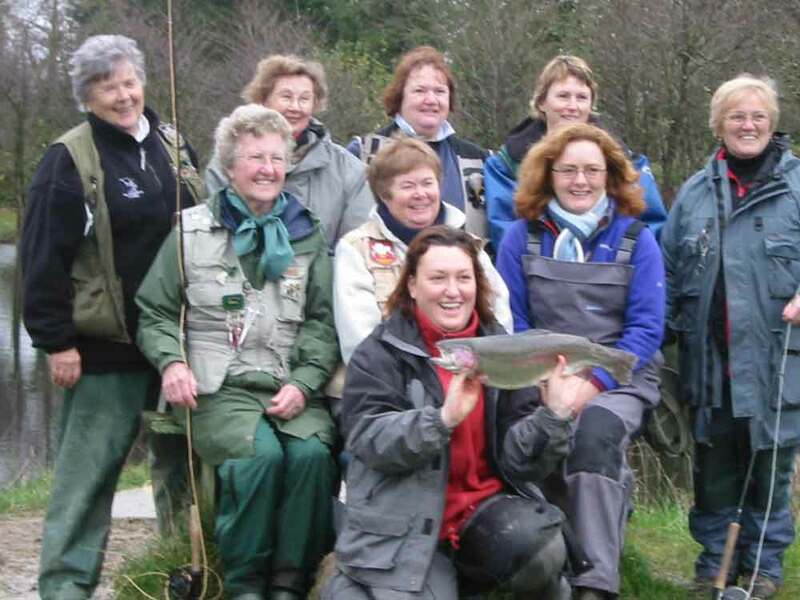 Six hard fighting full finned fish of 2 to 2.5lb, all on damsels and a flashback hares ear. Trout were busy chasing fry, which were jumping clear out of the water giving the trout's location away around Derwen lake. No takes on the other lakes though. 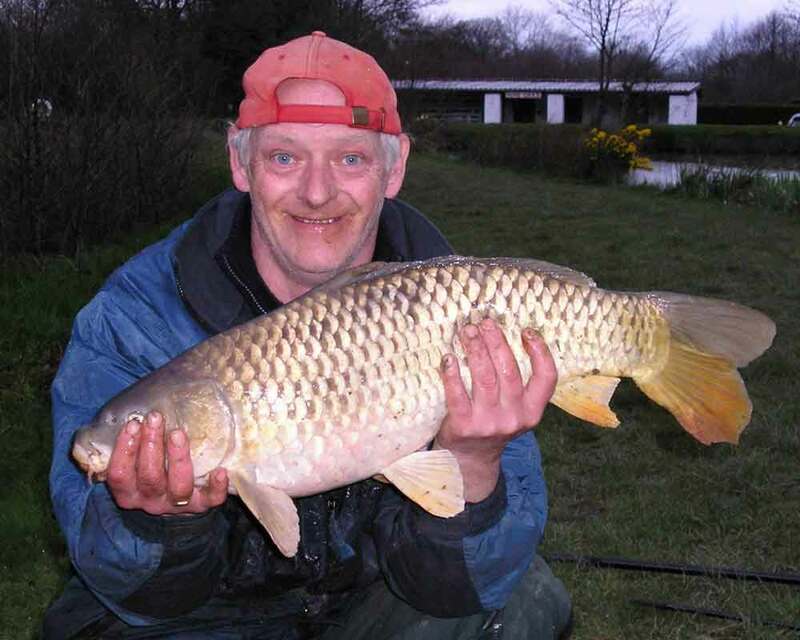 Lovely fishery with three nice trout lakes set in well kept grounds. Hope to visit again next time I'm in the area. PS: The deposit cheque arrived yesterday in the post. Just had 4 hrs fishing the top lake (Weir), first visit. Had a fish first cast and went on to hook 21! Landed 16, lost 5. The last one I lost stripped loads of line off, jumped several times, then bit through the knot right at the net. Looked 4+. Fantastic fighting fish in top condition. Never seen such scarlet colours. Tremendous. I was quite lucky I think to find a tight group of fish. I had half a dozen casts in the bottom pool with no result then quickly went up to the top one. Took two fish from the first gap, then one from the next gap, then hit the jackpot, hooking another eighteen fish, plus pulls, tweaks and nips. Fantastic. I thoroughly enjoyed my afternoon and I am now looking at the roach fishing with interest! My wife and I have a motorhome which, if we can't park it in your car park could be parked somewhere nearby ? Then I could have a session for roach, one for carp and one for trout. Nice! I too hope to see you again soon. PS I don't do Facebook or Twitter or any of that stuff. Maybe one day I will.....? 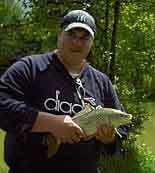 Hi Bill sorry have not been in touch earlier just a quick mail to say thanks for the great weekend fishing. It was all it was said to be, and we would visit you again soon once again thanks. Hi Bill, just getting back into the swing of things at work. Just a note to confirm how much I enjoyed by long weekend break at Nine Oaks last weekend. The advice on your website and given on the bank was spot on. Even if you didn’t get to show me how you tie a Grinner knot your way. With the breakfast sarnies and tackle and bait facilities, who could ask for more. 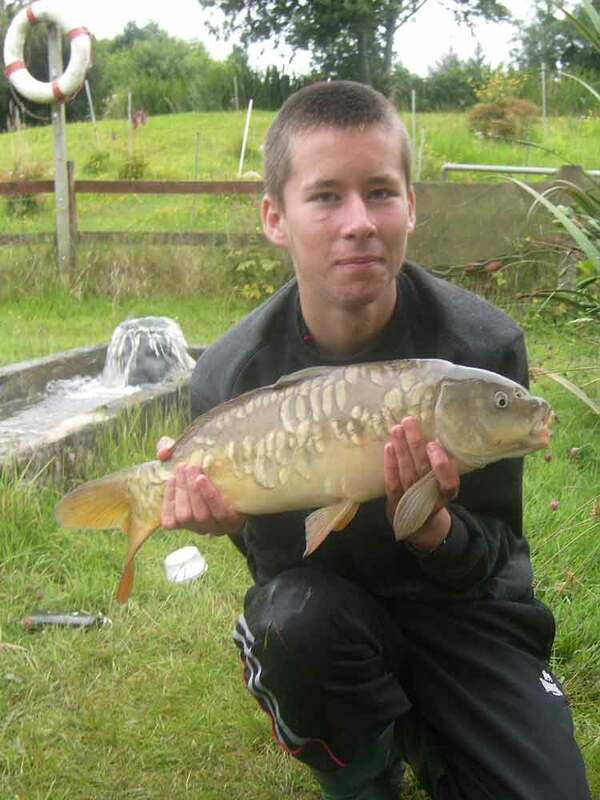 The pasties aint bad either, and I am not referring to small carp. I didn’t have any of those. Your lakes suit my passion for margin fishing, and I do mean “margin”. All of the double figure carp I had were within a foot of the water edge right at my feet. Will definitely be back again in the future, and them roach really do snaffle whole mussels. Received unsolicited mail from Ron Cousins (Welsh Correspondent for the Angler's Mail) and his wife Caroline, Sunday June 16th, 2013. We have just stopped running around long enough to thank you for two most pleasant days at your fishery. It was a pleasure to be on the lakes and the fishing was first class. I have also managed to add a few things to the accumulated years knowledge and will never look at a mussel in the same way again. I don't know whether I told you but I am on the Louise Elliot show on BBC Radio Wales between 2pm and 3pm on Wednesday and anglers are invited to ring, email or text with questions or opinions for discussion. Received reply email from Owen Harris in response to an email from Bill, Monday March 18th, 2013. Thanks Bill. We had a very good time - the cottage was very comfortable. I did find the missing payment - it was on my account as unclaimed probably because I made a mistake with the address. You will certainly see us again- perhaps later in the year. Received unsolicited email from Simone McNeil of Aberporth, Monday 13th, August 2012. Thank you Bill and Val, for another memorable fishing day for the grandchildren and their parents (and myself and Tony - grandparents). Having taught them the rudiments last year they couldn't wait to have another go. They remembered all you had said. We couldn't have had a better day. Caitlin (aged 9) caught a fish at her first cast! Then 2 more immediately! She had ten before the end of the day. 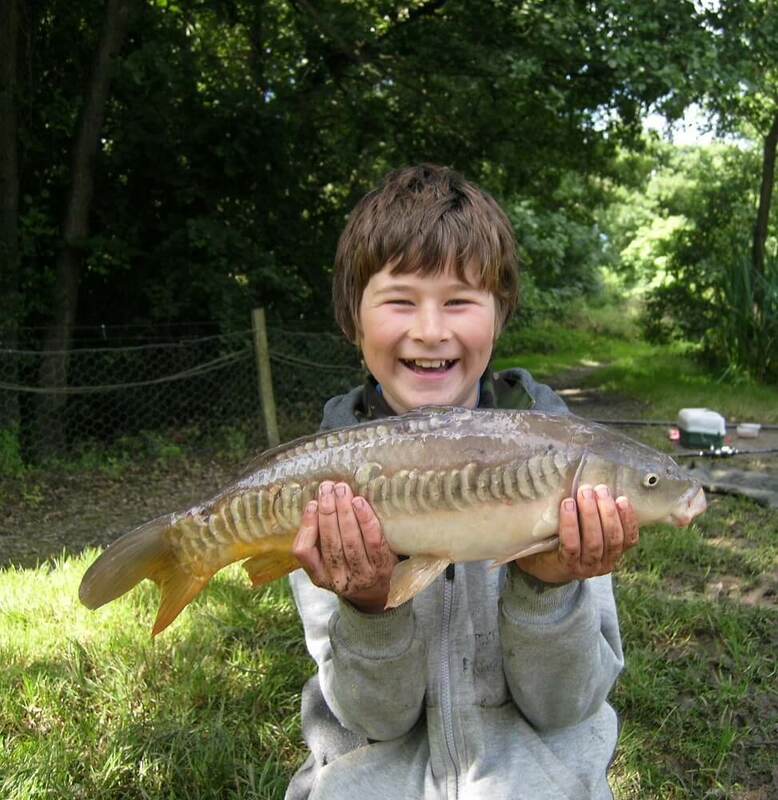 Conor (aged 12) had to be more patient but he too caught 10 fish before the day was over. Tony caught 28! Even I managed 4 small roach and then a good sized carp, followed by a very attractive mirror carp and on my last cast of the day a superb golden carp! This was such a super family activity and one we will all look forward to on another occasion. Thank you for organising such excellent weather too in a summer of appalling weather conditions. We regularly recommend Nine Oaks to others interested in fishing and they are always thrilled with the number and variety of their catch. Our day was EXCELLENT! Received unsolicited email from Stephen Prydie Monday 6th, August 2012. Fishing Review: Hi bill , dropping you a line to say what a great time we had fishing overnight last weekend . You helped me land my p/b common carp 16and a half pound ,what a fight and what a fish .We will be coming again this month for another over nighter and will bring bait this time , hope you can forward me the pictures you took of the fish I would appreciate it very much. Received unsolicited email from David Wright of New Quay, Cornwall Monday 9th, July 2012. Hello Bill and Val, Really enjoyed our stay with you last week, shame about the weather, never mind the break did us both good, bit of a wrench for both of us getting back to work today, the week went so quickly. We would very much like to stay with you again next year, are you taking bookings yet? If at all possible we would like Snowdrop again and also the same week, last weekend in June and the first week in july. Best wishes Dave and Linda, Newquay Cornwall. Had another fantastic evening fishing and got my new PB with an 8lb common, then 5 minutes later Loz matched it with another 8lb. Received unsolicited email From Joyce Linaker of Glossop, Derbyshire July 3rd, 2012. Hi Bill and Val - Just received my damages cheque and the thank you note from yourselves, which is much appreciated . 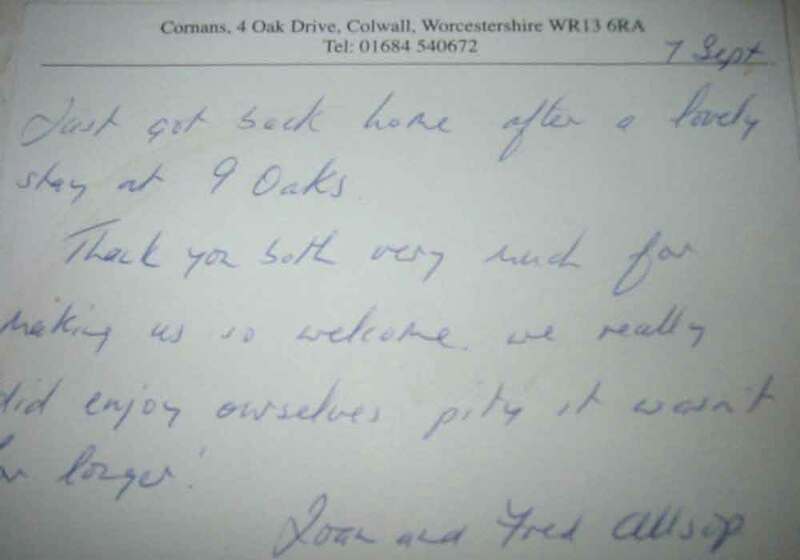 We had a very enjoyable stay at Nine Oaks and highly recommend it to others - great fishing, lovely clean caravan and a great holiday all round. Thanks again for a great holiday. Just wanted to say thanks again for the caravan, the fishing and most of all to you for being so friendly and welcoming! We had a good run back, stopped for 30 minutes but still made it in less than 6½ hours! I hope everything was in order with the caravan. Jake sends his best wishes to Dylan! Thanks for a great weeks hol had by all.We were really lucky weather wise this time.and had some great catches. I wonder if you could tell me how much it would be if we came on weds 12th, June 2013 till sat 22nd, also the price if we did 15th, june to weds 26th,.and even 2 weeks from the 15th,. It will be my sisters 60th, birthday next year, so thought it would be nice to have a bit longer together.Sorry to get your brain working. 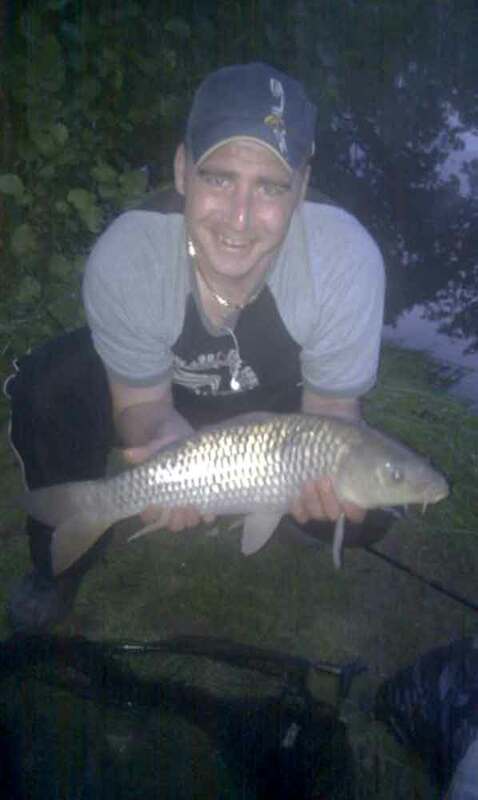 Had a great evenings fishing last night, Loz had 5 carp and i had 3 carp. His biggest was a 15lb common so we took a photo to send to you. We also got a sneak glimpse of one of the koi's, very nearly took my bait until a bigger carp got there first. We filled out a catch report. Thank you for making us so welcome and for ensuring we had a lovely Time. Message: Hiya Bill just to let you know I received the £40 deposit back this morning, thank you. Also, just to say we really had a wonderful time and we do hope to see you again Wendy. Received unsolicited email From Mr Peter Chisholm of Penrhiwgaled Arms, Cross Hands. Message: Hello bill was not able to find you when I left so can I pay double next time, which may be in 2 weeks? 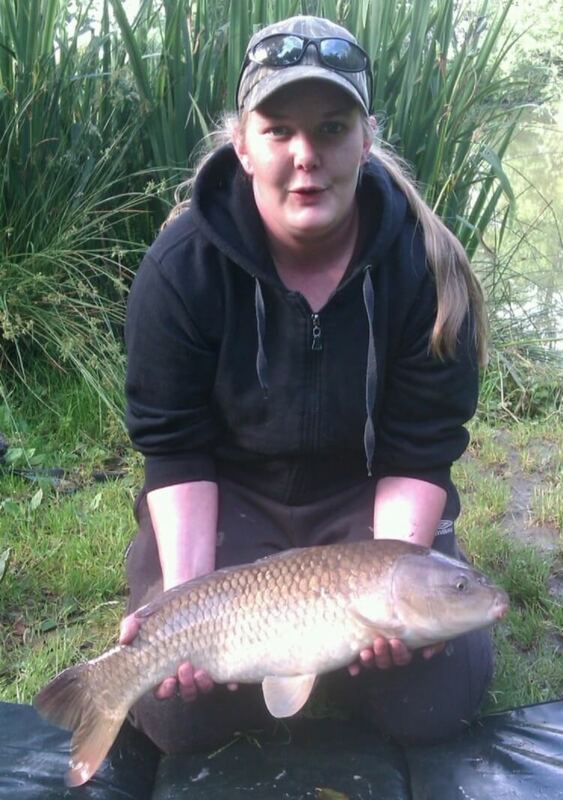 Oh, caught about 20 carp up to about 12lb mainly on cat biscuit, but also had some on bread. just wanted to say thanks for making our holiday so special. Everything was perfect. 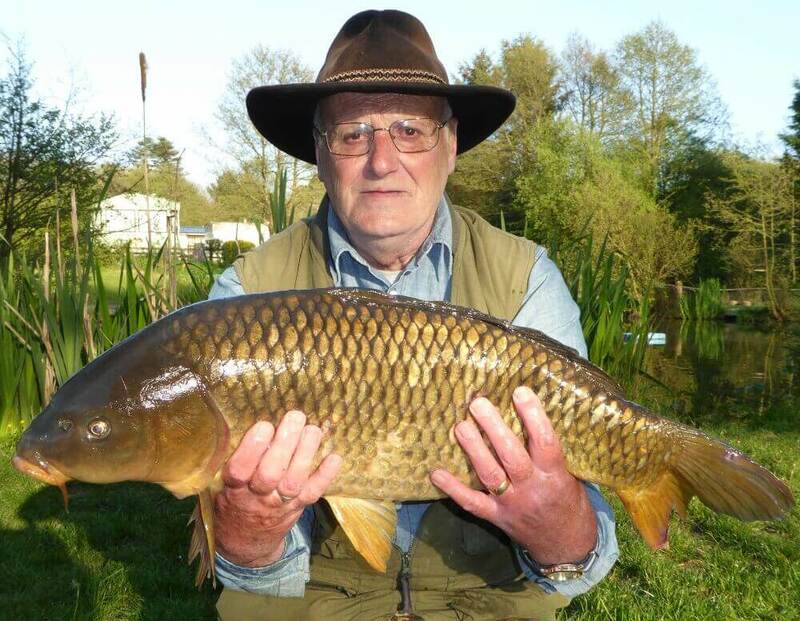 Lovely bungalow, brilliant fishing and great advice. We even had a few firsts. Ethan caught a Grass Carp and a Ghost carp. Dave had his PB on Main Pool a 20lb Common (will send you a pic) and I had my first Koi. Hope to see you both soon take care. From the Warrilows. PS: Morgan said hi to Dylan x.
hi bill i am still learning about this internet but wanted to say thank you for a lovely stay, the cottage was really nice and we enjoyed the surrounding area both walking cliff paths and cycling. hope to be back next year. Hi Bill, just an email to say thanks again for two awesome days fishing. I have spoke to my friend who is up for coming over to you for a few days fishing. We just need to arrange the time to get together and we shall see you again, I'm looking forward to it. 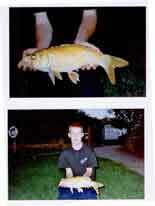 Here are some pics that I said I would email you, the grass carp pic is the one you took as I was about to pack up for the day he was 9lb and the mirror was 12lb. Thanks again. We stayed at Nine Oaks last week with my wife. We had the most wonderful time at Nine Oaks and Wales and I can't wait to return, but next time hopefully for a longer break. Please say hello to doggy Dyl and the fish for me. Keiron Houghton (Aged 11) from Widnes Cheshire with a 6lb Mirror Carp landed on the main lake on bacon paste pellet, and his older brother Stuart (Aged 15) with his 7.5lb Mirror Carp landed from the novice pool whilst fishing on slug. Once again, thanks for everything, we're all still "buzzing" from a fantastic week at Nine Oaks which far outweighed our expectations. I asked the kids on the way home whether they would prefer a Spain beach holiday or Nine Oaks, the answer was unanimous and we all hope to be back very soon. Just a note to say thank you, for a wonderful afternoon yesterday. 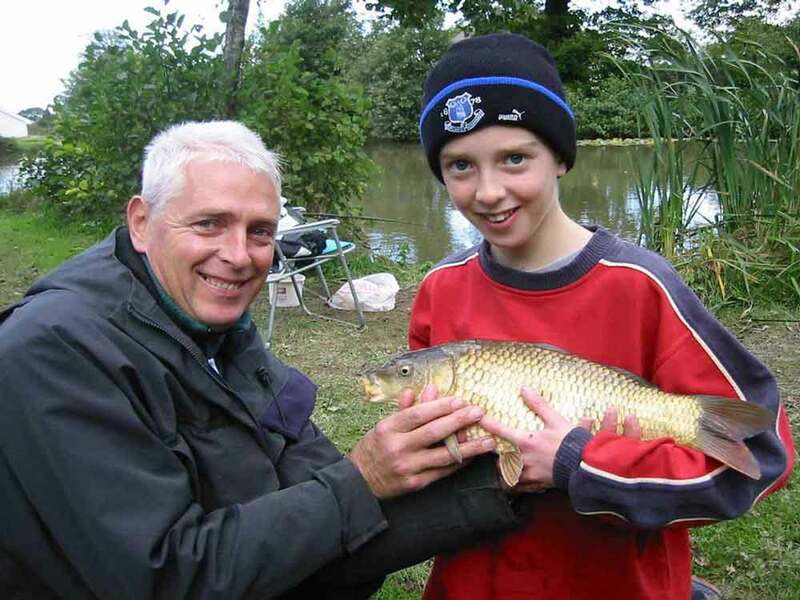 My Son Jo and I had a great time and with your training and advice we went on to catch a Common Carp of about 2lb. We will most definitely be returning and with the other family members! I work unusual shift patterns which include weekends so will miss out on your free training sessions for the youngsters. This is a shame. Nine Oaks is fantastic and I am pleased we found you. Very many thanks for such a delightful stay at Snowdrop. We had a brilliant time touring the pools even though we don’t fish. It seems as though we packed a fortnight’s holiday into a week! Received a copy from brothers Paul & Brian Trubshaw. What a fantastic card made by them for their 80 year old Dad for his 80th, Birthday treat - absolutely fantastic. To celebrate your forthcoming 80th, Birthday. 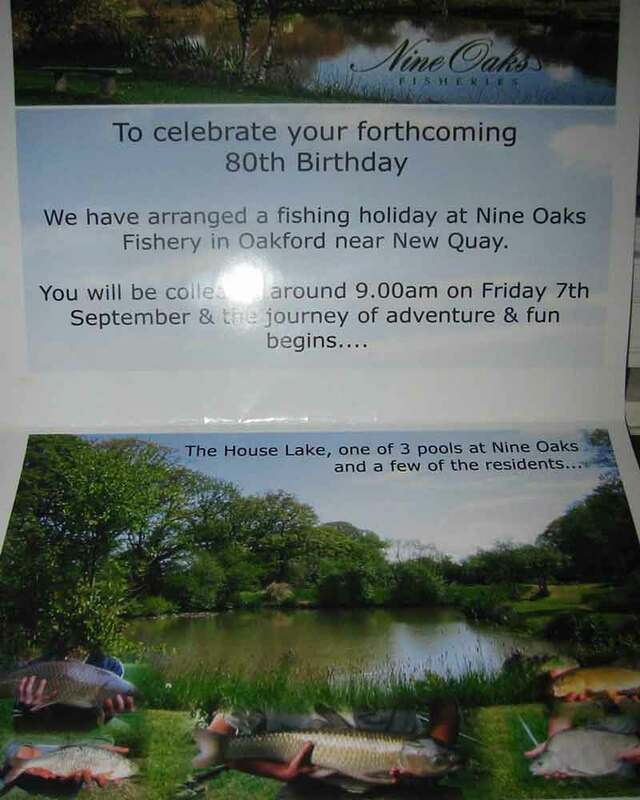 We have arranged a fishing holiday at Nine Oaks Fishery, Oakford near New Quay. You will be collected around 9.00am on Friday 7th, September & the journey of adventure & fun begins. The card contains pictures taken from our web site. Stunning! Received by unsolicited mail Friday 24th, May 2007 from husband & wife Brenda & Malcolm Herbert. Many thanks for a comfortable holiday, beautiful surroundings, friendly atmosphere and even good fishing! We're totally rested. We were so happy you were able to take our deposit/booking for next year and look forward to seeing you on 10th, May 2008. Received by unsolicited mail Friday 5th, July 2007 from husband & wife Joan & Keith Woodcock. We would like to thank you Val & Bill for the hospitality given to us during our week at Nine Oaks Fishery. 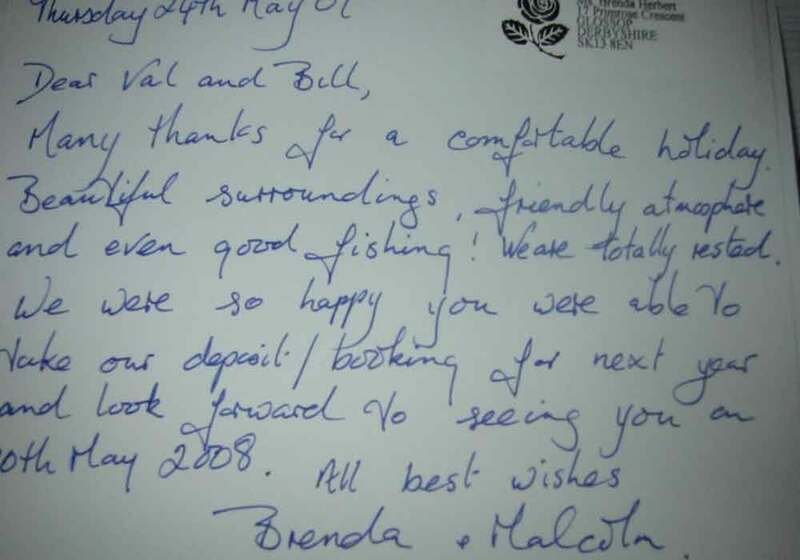 You made us feel very comfortable and the fishing and accommodation was excellent. 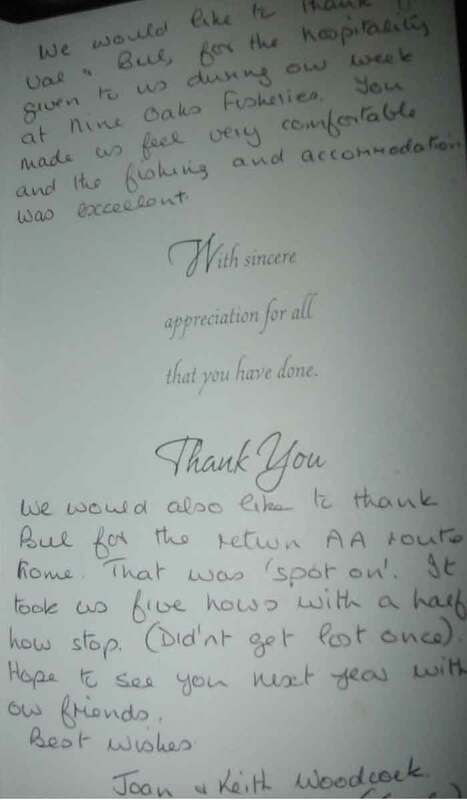 We would also like to thank Bill for the return A.A Route home. That was "spot on". It took five hours with a half hour stop (didn't get lost once). Hope to see you next year with our friends. Received by unsolicited email Wednesday 22nd, February 2007 from father and son (John Conlin) after their first visit here. Just thought I would drop you a quick email to say thanks very much for this weekend. My Dad and I had a fantastic time, the fishing, customer service and sarnies were excellent! We didn't catch any huge fish, but a PB Mirror for me, and a PB Mirror and PB Common for my Dad really made our weekend! (even if I did have to sit out in the wind & rain to catch my better fish!). We'll certainly be back soon! I have attached some of the photos I took, feel free to use them! Thank you and a very merry christmas to you both. The christmas card we received was a lovely picture. thank you again for a fab time. Received by unsolicited mail 7th, September 2006 from husband & wife Joan & Fred Allsop. Just got back home after a lovely stay at 9Oaks. Thank you both very much for making us so welcome and we really did enjoy our selves, pity it wasn't for longer? Received by unsolicited email Wednesday 13th, December 2006 from Husband and Wife who had stayed and fished at Nine Oaks previously. Thank you very much for another very relaxing and comfortable stay at yours. We do really love it there and would like to book again for 2007. Would it be possible to book the 2 bedroomed for three people - in on Monday 29 October and out on Sunday 4 November, 2007, 6 nights in all and hopefully lots of fish and good weather! Please confirm. Look forward to hearing from you. 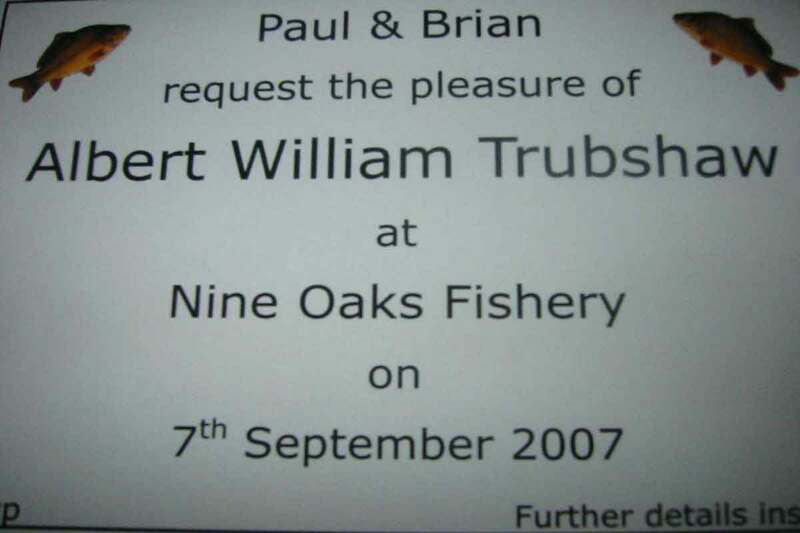 Received by unsolicited email Sunday 2nd, July 2006 from two who had night fished at Nine Oaks for the first time. We thoroughly enjoyed our stay with you very recently, and I attach a photograph of the biggest catch of the week for our lads. My husband Arnold and I are really looking forward to seeing you both again on 5th, August as agreed. Again, many thanks for a lovely time. from Joe & Deann [megon@wildblue.net] from mid-west USA in response to email from Bill 18th, April 2006. I was waiting till I actually caught a fish. While I have caught some sun fish nothing worth commenting on. Distance and accuracy are improving. I'll always remember to "flick it". We did enjoy Wales very much. The time we spent with you was very special. Your instructions and personal attention will really enable me to enjoy the sport of fly fishing. The conversation was great too. You'll get a picture of the first big one. We hope to return to Wales next summer, if we do we will be sure to come by. 7th, September 2005 postcard received from Joan and Fred Allsop, Colwall, Worcestershire. Just got back home after a lovely stay at Nine Oaks. Thank you both very much for making us so welcome. We really did enjoy ourselves, pity it wasn't for longer? Had a great day at your fishery the other Sunday, You kindly said that you could email me a copy of the 6lb fish I caught. Sorry its taken me so long but I have been ill and this is the first time I have been able to use the computer. I'm telling everyone what a great day we had. Still no piece in last week or this weeks Carmarthen Journal but perhaps after xmas they will pop it in. Cheers for now - hope to see you in the New Year. My son, Jake, was carp fishing this morning on the old trout lake. 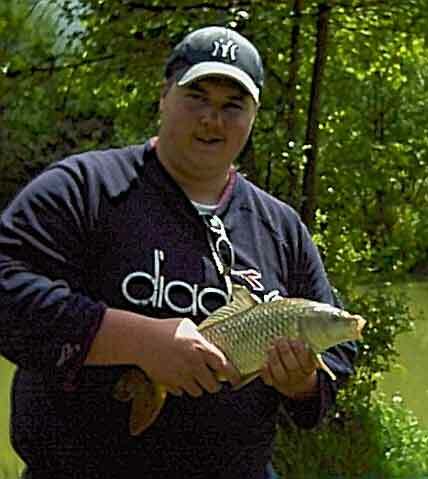 You kindly took a picture of him with a carp. I should be very grateful if you could email this to me at the return address. The quality of the fish in this lake is superb! hi bill, just like to thank you for a fantastic week myself and the lads had last week. the changes you have made are a great step and look forward to seeing you again next year. Bill, Julia and I would like to thank you for a friendly and enjoyable day at Nine Oaks last week during our stay in Pembrokeshire. We both remarked during the rest of the week how well the fishery is kept and run, having visited a vast amount of trout venus on our travels the standards vary considerably. Nine Oaks is amongst the best we've found and is a credit to your hard work. We both caught after 7pm during a hot day. The trusty Diawl Bach and sinking line never seems to fail in Wales and tempted us nine prime fish, two of mine well over four pounds and one in particular well over five. We both wish you all the best a Nine Oaks and hope to see you again one day. 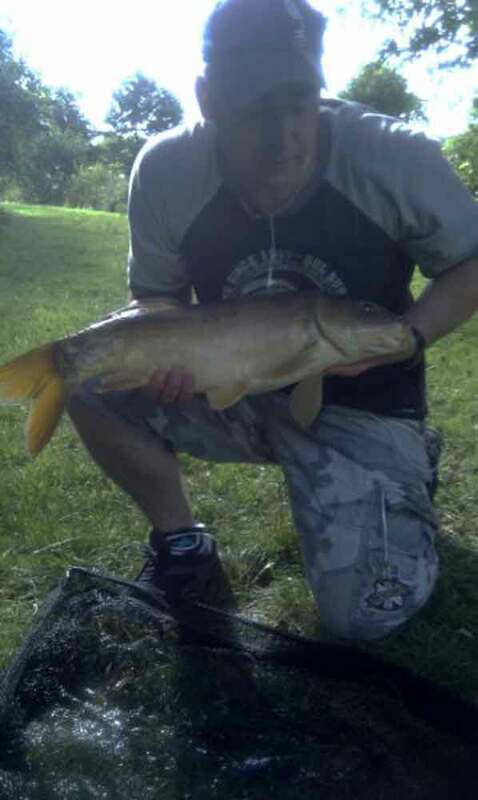 thank you for all you're help and advice on sunday which helped me catch my biggest ever carp. thought you might like this picture.